Places like Sweet Pot are what make alt.eats tick: ‘Where the hell are we’ location? Check. Dilapidated shack of a building that makes up for its shabbiness with a double dose of unaffected charm? In spades. Novel menu items? No doubt. And, for extra credit – beverages for, umm, putting the lead in your pencil? Yeah, they have that. 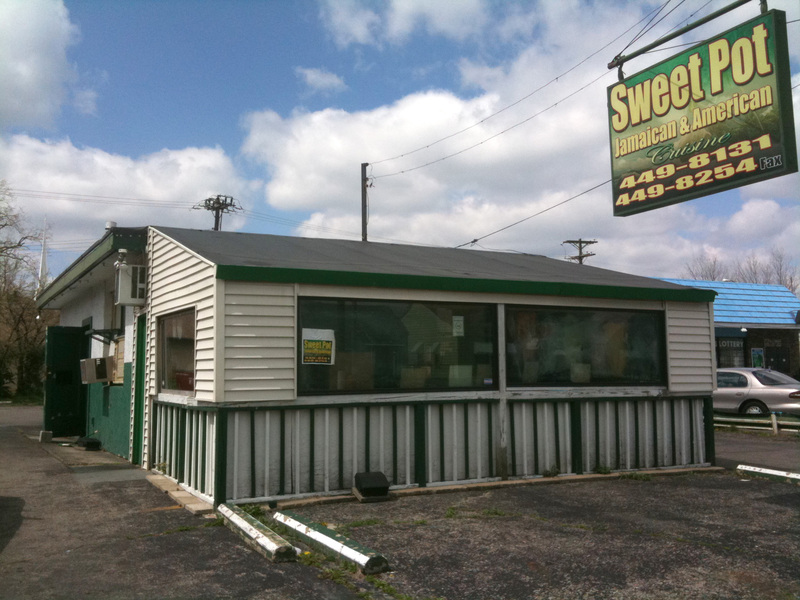 Sweet Pot’s building is somewhat forboding… think Calanley with a few more windows. Step inside, though, and the vibe is more that of a run down gulf coast shrimp shack. A series of glass panes separate the dining room from the kitchen and allow customers to see everything going on in the back of house. On our visit, we saw massive pans of jerk chicken being pulled together – they were obviously busy with a large catering order. Which is not to say that we felt neglected. 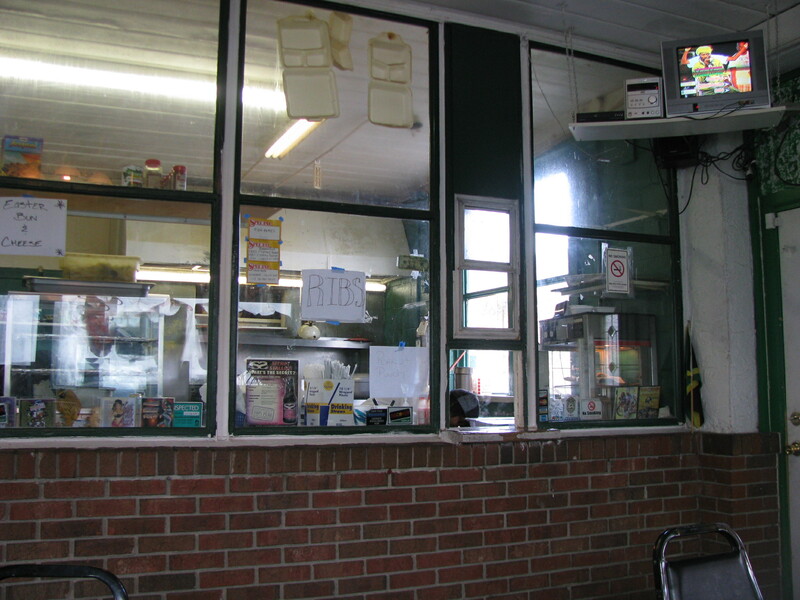 Ordering occurs at an opening in the window, through which you’ll also receive your food. The folks running the window were happy to answer questions and were notable for not tailoring their answers to what they thought we’d like. So, I ordered two ‘Tiger Bones’, a couple of ‘Bedroom Bullies’, and a ‘Magnum’. Alright, so maybe I didn’t. But they serve ’em and they’re certainly not shy about letting you know who they’re for. Returning to the more gender-neutral portions of the menu, we settled on orders of goat curry, jerk chicken, oxtail, and a mystery fish dish that whose appearance at our table was the result of some confusion at the order counter. The goat curry was excellent – a generous portion of tender, flavorful meat devoid of excessive gaminess. The curry seasoning was fairly mild, allowing the full flavor of the goat to shine through. 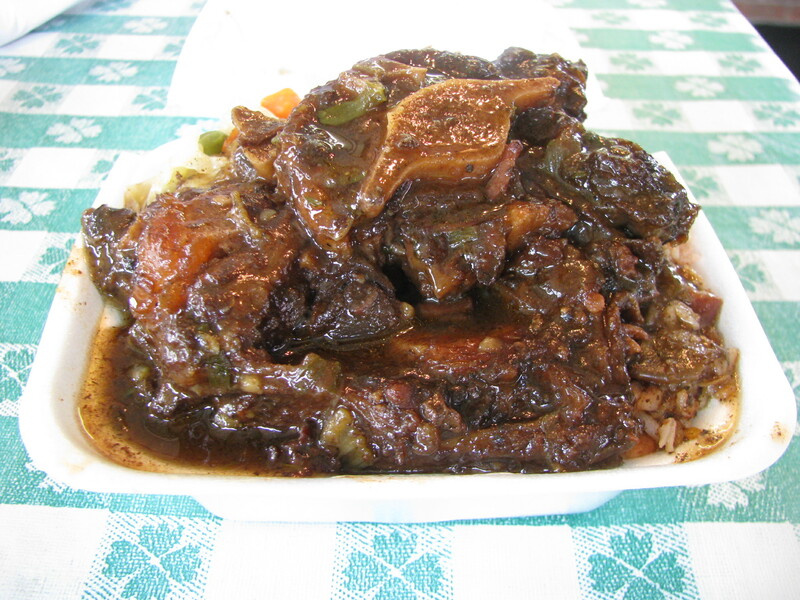 The oxtail was also good – tender meat in a rich stew and particularly notable for being less fatty and greasy than other iterations of this dish. The jerk chicken was both enjoyable and a bit of a curiosity – enjoyable in the sense that the chicken was properly grilled and nicely flavored, and curious in that it tasted more like barbecued chicken than what we’d normally think of as jerk-seasoned meat. The fish was the red-headed stepchild of the bunch. It struck us as being a fairly dry baked white fish of some (undisclosed) sort that was doused in an eye-poppingly acidic vinegar sauce and topped with shreds of veggies. A similarly tart slaw accompanied. All of the above were the ‘small’ portion sizes, and they pile ’em high. All were served with beans and rice with peas, which were roundly deemed exceptional. Whether you choose to eat-in or opt for takeout, you’ll get your food in to-go clamshells. And, in the best of alt.eats tradition, the availability of menu items vary based upon day, time, whim, and perhaps astrology readings. Vegetarians take note – Sweet Pot has a significant meat-free offering. 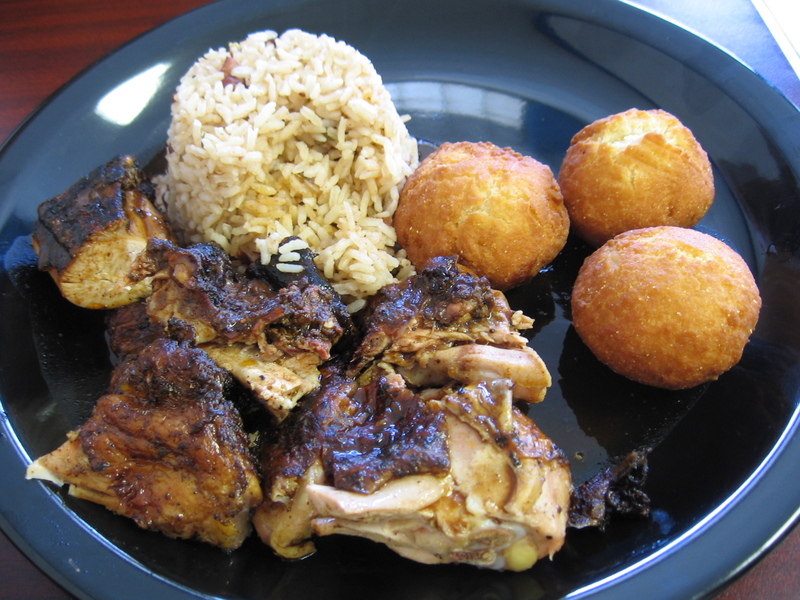 Island cuisine isn’t something we run into often in Columbus. When someone brought in some Dominic’s takeout into a bar I was at a few weeks ago, I promptly attacked the poor man for more information and the take out menu. I was also trying hard to charm him into sharing some of his food with me, but all the winks and offers of free beer went unanswered. After eating at Dominic’s, now I know why the stranger refused to share. TacoDrew and I ordered conch fritters for starters. (Conch in Columbus, we thought? It is a menu item not easily found fresh in Cbus) Our instinct were correct, the chef came out and apologize for the lack of conch and offered us cod fritters ($5) instead. 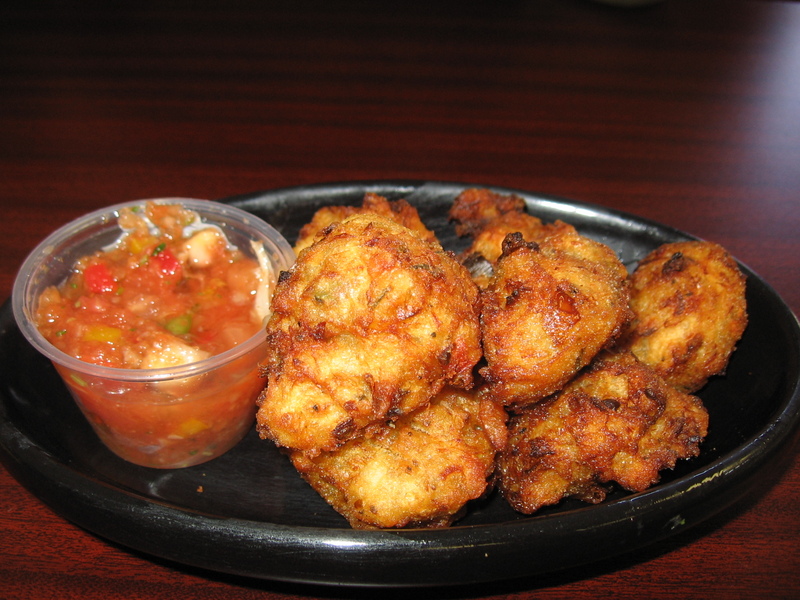 These fritters were similar in execution as hush puppies. Instead of cornmeal, we have a batter of salted cod, pickled onions, scallions and a small amount of flour. The accompanying sauce was freshly made with lots of the usual salsa like ingredients. However it slightly more tart due to the vinegar and it was a great counterpoint to the fried fritters. 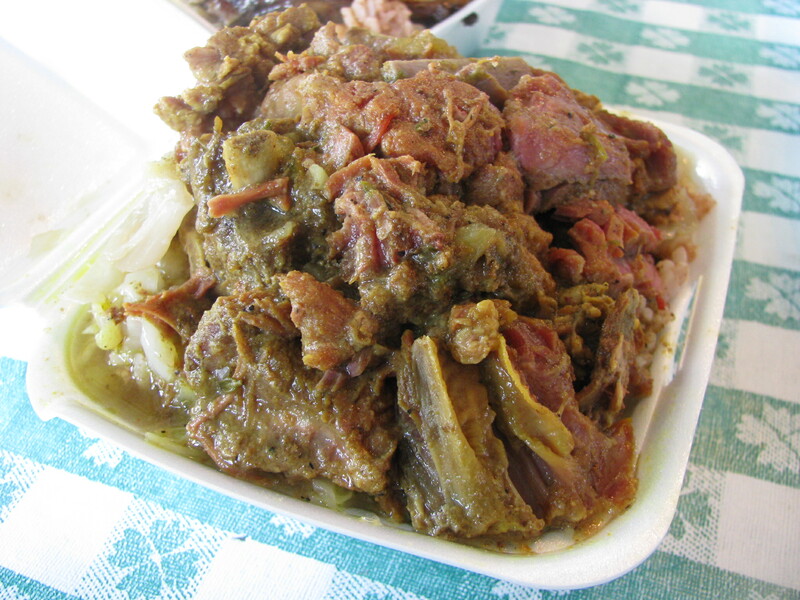 For our entree, we ordered a medium sized curry goat ($8) and jerk chicken ($7). The entrees comes with two sides. 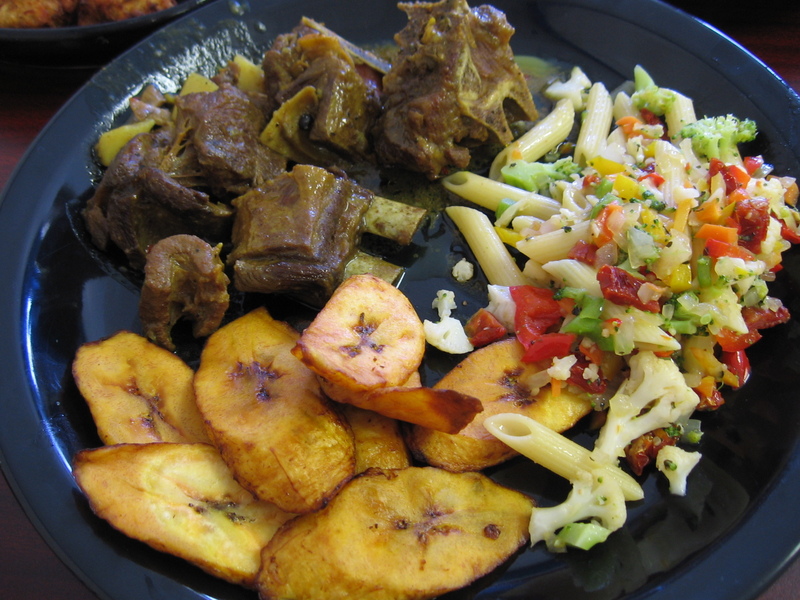 We picked fried plantains and pasta olivonge for the goat, rice and peas and fried dumplings for the jerk chicken. The goat was tender and falling off the bones and lightly season with curry powder. It can be made spicier upon request but we were told by the waitress that they eat it on the mild side in Jamaica. They really know what they are doing with goat here as it is devoid of the usual musky and uric properties that goat tends to have when handled improperly. The plantains were sweet and fried with skill as it was not greasy. The pasta was a nice surprise as it was refreshingly light and healthy with lots of veggies and the use of sun-dried tomatoes was lovely. This is a jerk I would be happy to see. The chicken was tender, had a great smoky flavor and was well seasoned with jerk spices. There is an option for white meat for an additional $1 but we stuck with the recommended dark meat and did not regret that choice. The fried dumplings that came with it was a cross between a donut hole and a biscuit. It would have been best eaten for dessert with some jam. The rice and peas were amazing! I couldn’t stop eating it, then again I am a sucker for rice cooked in coconut milk. It was rich without being cloying and made the rice very fragrant. Marlon and Andrew runs Dominic’s which is named after Marlon’s son. 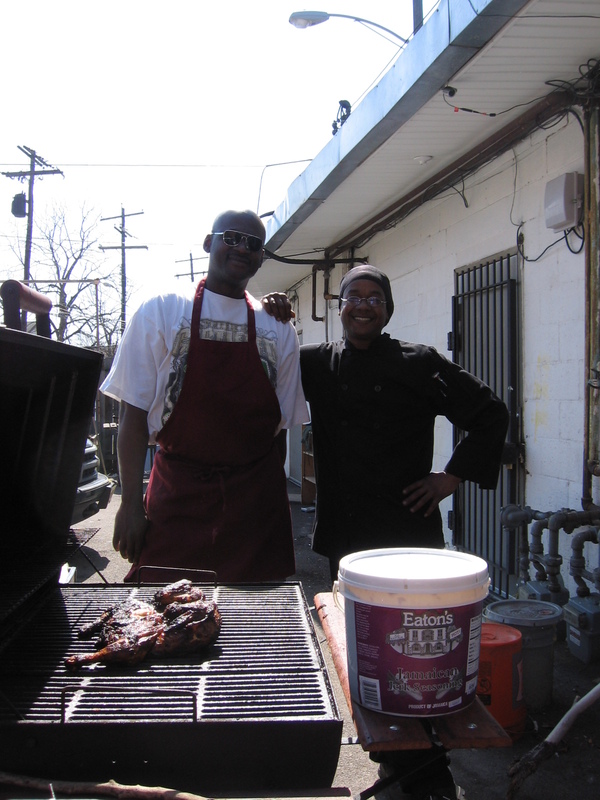 They were very friendly and hospitable and went out of their way to educate us about Jamaican food and showed us how they made jerk chicken out back. It is slow roasted over charcoal embers. Andrew told us that the secret to jerk is freshly ground pimento (allspice) and black pepper. 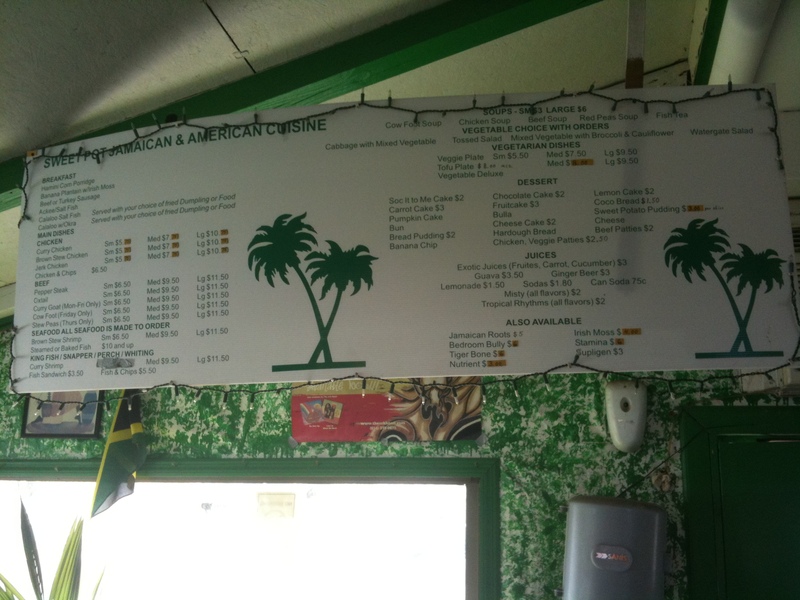 The menu has quite a few vegetarian items but Andrew said that he has a longer list of vegetarian dishes in his head. 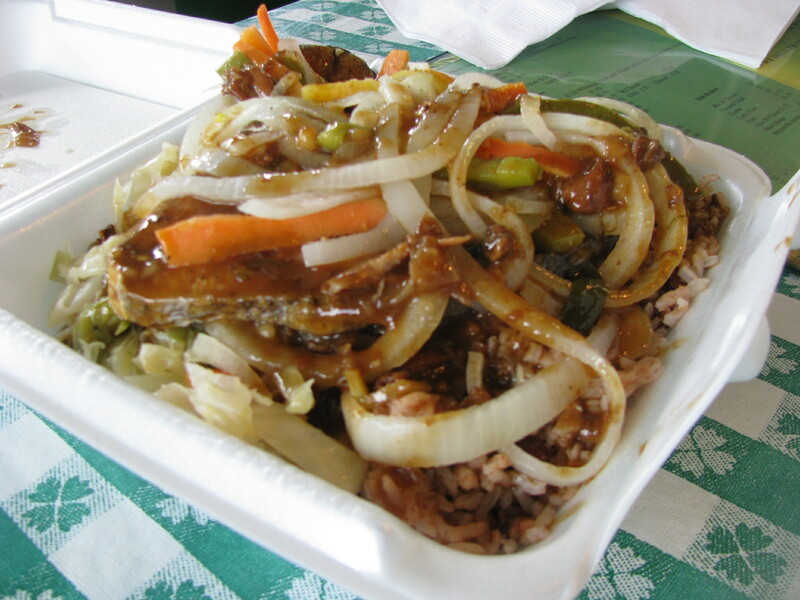 So if you want vegetarian Jamaican grub, just ask Andrew for some suggestions. He does vegan too by request. 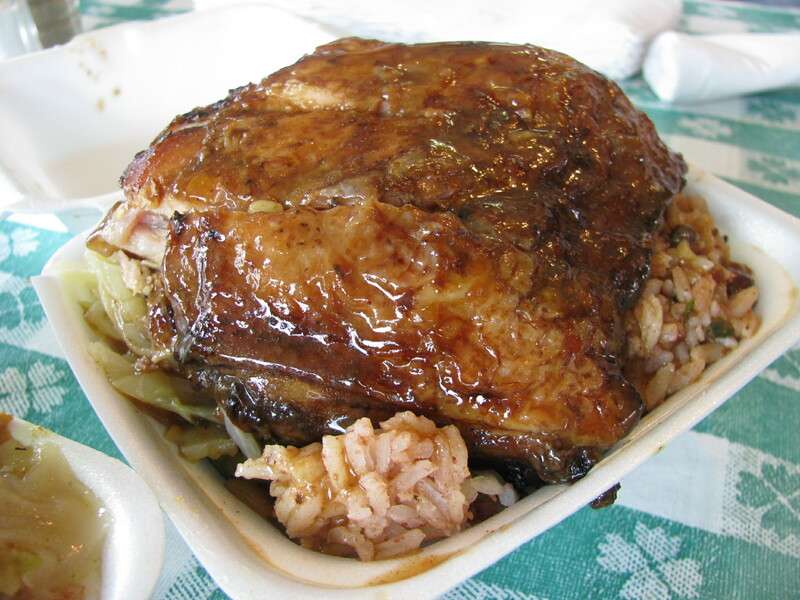 Needless to say, we will be back for more as there are some other traditional Jamaican dishes to explore like ackee, saltfish and oxtails. 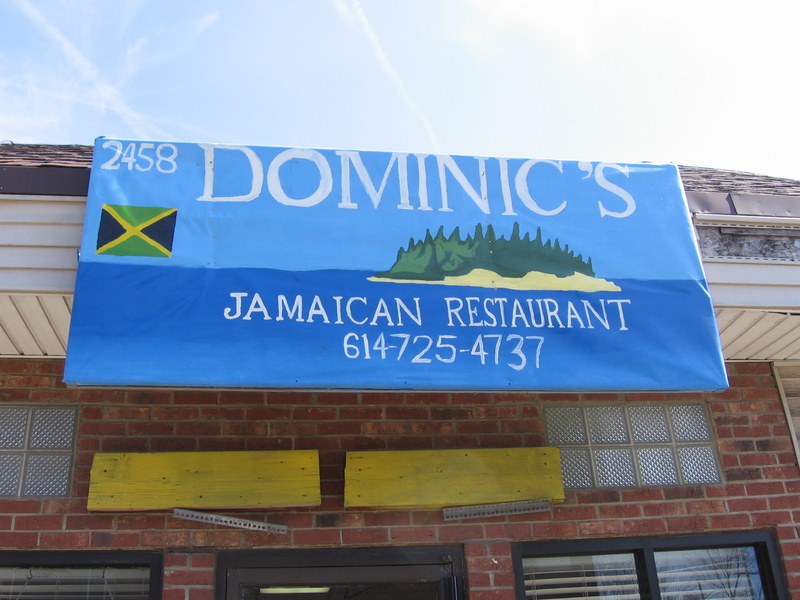 Dominic’s may be new to the restaurant scene, having recently opened in Feb 2010, but there are some old hands back in that kitchen brewing some island magic.